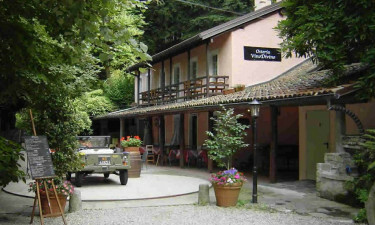 Valle Romantica is a holiday camping site found within the Cannobina Valley of Italy and is located a mere 5 kilometres from the Swiss border. Those who are searching for camping luxury within splendid natural settings should contact LUX-camp for more information on this exciting location. Why Should I Select Valle Romantica as a Luxury Camping Site? 188 tourist pitches and a choice of mobile homes. Many rare plants located within the confines of the resort. Separate locations for younger individuals and groups. Technology Alongside Comfort Although Valle Romantica prides itself on its natural surroundings, guests can still enjoy modern conveniences. Some examples here will include a gas bottle exchange, mobile homes equipped with Internet service, on-site shopping facilities and 36 separate washing cubicles. Anyone arriving with infants or toddlers will be happy to learn that baby changing rooms are included as standard amenities. One aspect which sets the luxury camping site of Valle Romantica apart is that nature seems to exist around every corner. Numerous plants flourish here and some such as azaleas and camellias add to the scenic beauty of this area. Swimming in crystal clean water is also a benefit here, although there is an open-air pool found within the complex as well. 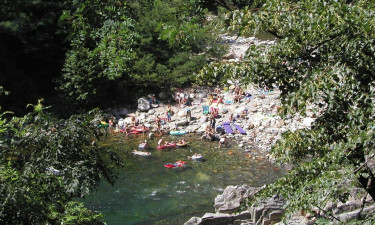 The Cannobino River is another amazing attraction and families can appreciate its beauty by walking a natural footpath that follows its course. Many arrive here for a camping holiday that is also defined by a choice of leisure activities. 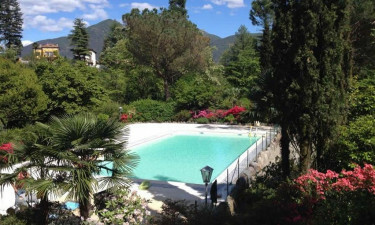 Valle Romantica addresses this need through a host of unique options to enjoy, witha handful of on-site examples including angling, volleyball, table tennis and swimming. Venturing a few kilometres away from the site provides additional attractions including sailing, surfing, boat hire and daily bicycle rentals. There is also a children's play area within Valle Romantica. Vino Divino is a must-see restaurant within this luxury camping resort. An ancient wine cellar serves up some truly magnificent selections that are popular with anyone who enjoys a tasty drink. The cuisine here promises guests a taste of traditional Italy, although international options are always available. A small bar within this venue offers guests a variety of cocktails, beers and wines. This is an ideal spot to spend an evening or to order an aperitif after a fulfilling meal, and the outdoor dining underneath large chestnut trees enables visitors to partake in a once-in-a-lifetime experience. This holiday camping site is fully stocked with all of the provisions that discerning guests have come to expect during any camping holiday. Organic foods, fruits, vegetables and wines are provided here, as well as basic supplies, together with international newspapers. There is even the possibility to rent a small refrigerator during your stay to keep your food nice and fresh. This miniature market is found only moments away from all mobile homes and pitches. Anyone who is impressed with what this luxury camping experience promises should speak with LUX-camp to obtain further details.